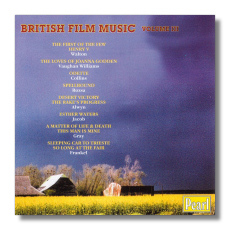 Pearl continues with their excellent issues of British Film Music with a third volume of historic recordings. This one includes a number of films from the immediate post-war era that are quite rare to find but all the music is interesting material. The famous 'Spitfire' sequences are conducted by Walton himself whilst the evocative pieces from Henry V also feature the composer in altogether more relaxed vein. However I enjoyed most of the rare music especially the evocatively mysterious 'Sleeping Car to Trieste' with Benjamin Frankel's music entirely appropriate. Muir Mathieson conducts most of the music such as 'Hungry Hill' by John Greenwood and a splendid 'Derby Day' by Gordon Jacob, another grossly underrated film composer. I was also pretty chuffed to hear a 1950 recording of Frankel's 'carriage and Pair' conducted by Charles Williams, this is also available on one of Hyperion's splendid British Light Music CDs. The recordings have come up pretty well in the transfers from what must have been tiresome originals. Is there room for a fourth volume please? !